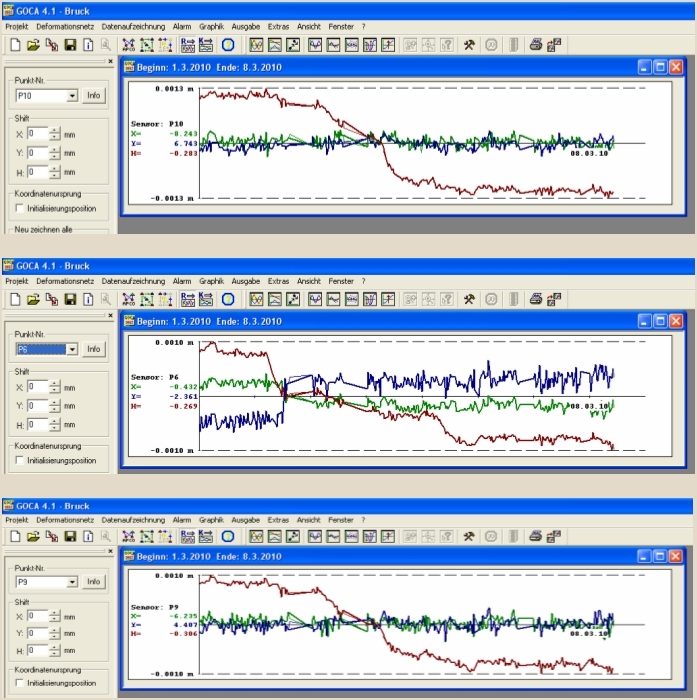 Since spring 2005 the GOCA-System has been rented in cooperation with GOCA partner DrBertges for the monitoring and deformation analysis of the new power station Weir Rheinfelden by Ganz&Rutner Ingenieur GmbH (GRI). GNSS/GPS und terrestrial sensors (totalstations and levelling instruments) area applied. As concerns GNSS/GPS L1/L2 530 and 1200 sensors of Leica Geoystems are used. The GOCA monitoring network is designed to provide a threedimensional accuracy for horizontal and vertical displacements of less than 2-3 mm and a respective high sensitivity. A discrete epochwise use of the GOCA-systems in a half-year cycle has been planned. The monitoring network for the new power station Weir Rheinfelden consists of 8 long-term stable GNSS/GPS reference points, which are partly situated far outside of the moving area of the bed of the river Rhein and a salt exploitation domain and is designed for a 100 years monitoring duration. The 5 GNSS-object points are linked to the further object-points of the Weir Rheinfelden by LPS-measurements (totalstations, levelling instruments) (figure). The epochmeasurements are performed by using the online telemetric mode as well as the nearonline mode of the GOCA-system and the GOCA-software©GOCA-Team Karlsruhe, respectively. 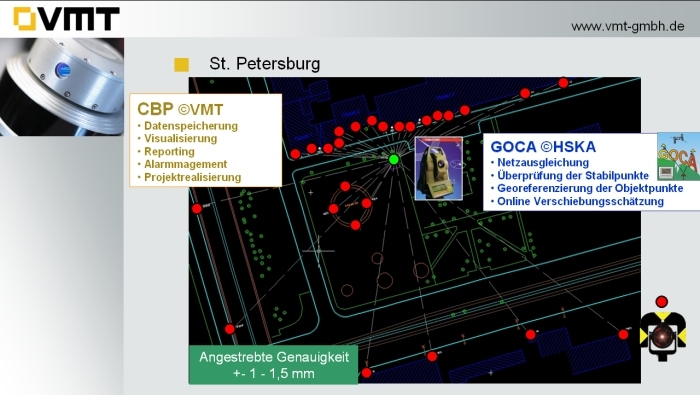 The powerful mathematical model of a strict multistep and network-adjustment based deformation, which is implemented in the GOCA-Software, enables to set up the GPS-basestations during the measurements in the unstable objectpoint domain, to achieve short and high accurate GNSS-baselines. 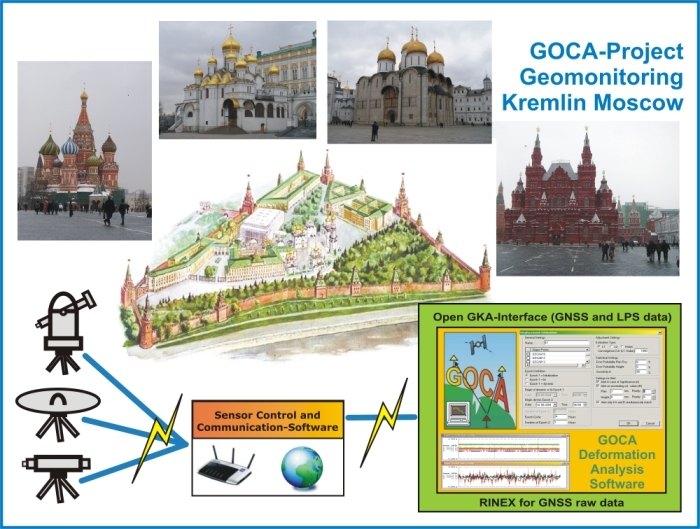 Occurring displacements of the GNNS/GPS-basestation are automatically considered and properly modelled in the mathematical model of the GOCA-software. In the object-point area of the weir construction the GNSS/GPS-measurements are completed by terrestrial measurements, which can be combined in the GOCA-software, version 4.0 with GNSS/GPS-data. The data acquisition for GNSS/GPS and LPS is done by the software GOCA_DC3 ©DrBertges, and is based on the open GOCA-software interface GKA. All epoch adjustments, the statistical analysis of the stability of the reference points, as well as the statistically based strict displacement estimation as object of the deformation analysis are performed at Ganz&Rutner by using the GOCA-software. Die next measurement epoch at Weir Rheinfelden with the GOCA-system will take place in November 2005. Those who are interested in a participation at the GOCA-measurements, including a life presentation of the GOCA-system, are asked to get into contact with the Ganz&Rutner company. 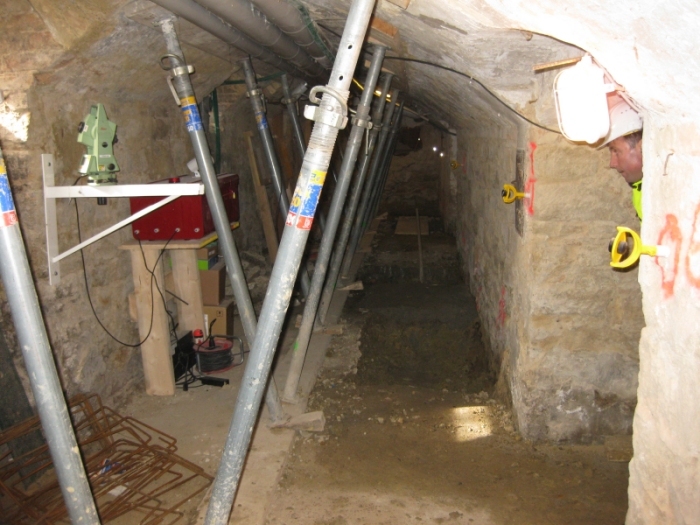 Dimension of the Monitoring Area with a size of 12km x 3 km and Height Differences of 550 m.
GPS-based full automatic area monitoring of the worlds longest railway tunnel with the GOCA Deformationsanalysis Software together with the data aquisition- and communikations system GOCA-DC3. 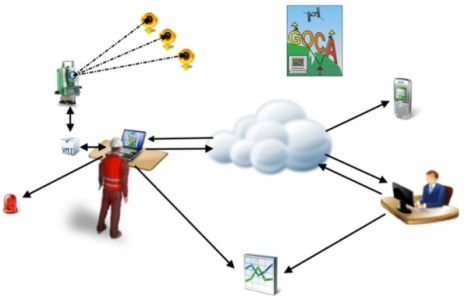 The GOCA-Software works in a long-distance remote control mode and realizes an online deformationsanalysis based on a strict network adjustement of different types of sensor-data - namely baselines-vectors (and raw data) and total stations data - using a clear defined open data interface. Based on the division of the sensor array into a stable and an object area the adjustment provides die 3-dimensional coordinates of the object-points in the reference datum of the stable points. The resulting object-point time series are visualized and submitted to least squares and robust filters and trend estimations, e.g. Kalman-Filtering, and the respective results are also shown in graphic windows. An automatic alarm is to be realized by the user-defined setting of a critical 3-dimensional state vector for the displacements only and for displacements-velocities-acceleartions of the object points. 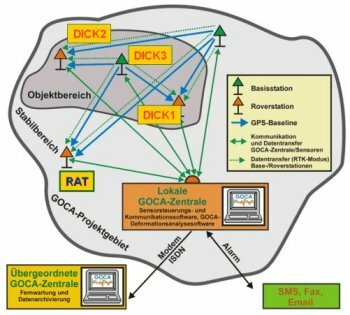 The communications- and datenacquisition system GOCA-DC3 of Dr. Bertges, Vermessungstechnik allows to handle the link of the GOCA software to different kind of sensors and communication channels. GOCA-DC3 consists of at least on central processing unit (so-called data concentrator) and several external sensor control units. GOCA-DC3 is has a modulary and scalable design and allows a quick adaption and extension to the users request even during the operation mode. The aquisition of the sensor data (GPS, Total-Stations) may take place in a real-time, near-online and an offline mode. The data-change with the GOCA -Software may run online or offline. The sampling rates and the observation design are to be choosen in a variable mode. Since 11th December 2002 the GOCA-System is installed at a factory area using five GPS-sensors (DICK3 and RAT with L1/L2-MR2 receivers of the GeoNav company, the other three object points with L1 GeoNav-GOCA receivers of the Karlsruhe University of Applied Sciences). 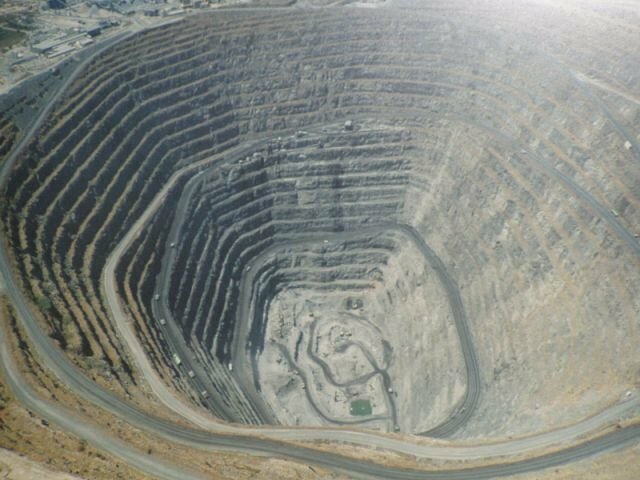 The aim is to detect deformations - especially in the height-component - in context with a nearby situated open-cast mining area. 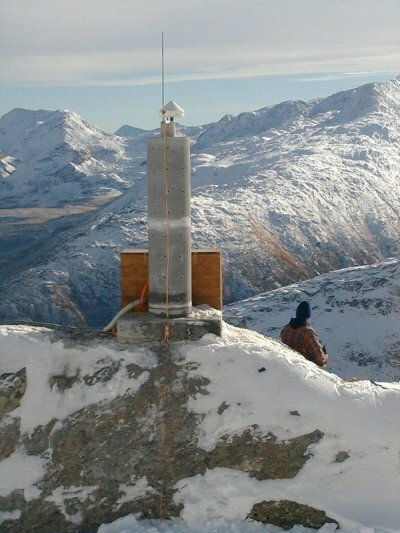 The figure below (left side) shows the monitoring design, the figure on the right shows the GPS reference-station DICK3, which is acting as an object point. Precise levelling is carried out for the control of the height-deformations determined with the GOCA-system. The previous investigations show a correspondance of the height-deformations detected with GOCA and the precise levelling in the mm-sensitivity-range. Monitoring of Kops Dam. Illwerke Vorarlberg, Austria. 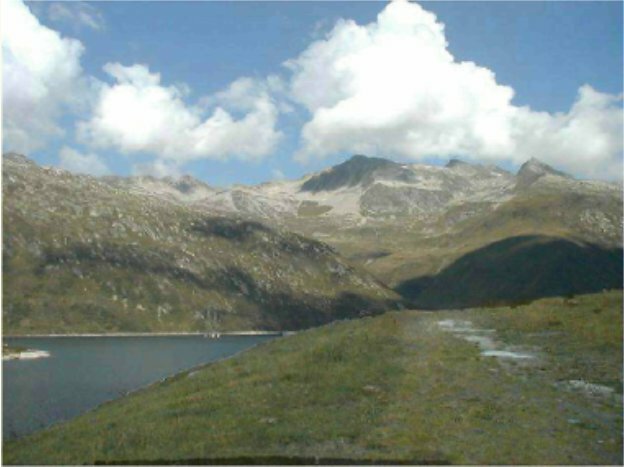 Since May 2001 the Kops Dam of Austrian Illwerke Vorarlberg/Austria is monitored with the GOCA-System. Three GPS-Sensors are installed: two on object points and one on a stable point. Object points are situated in the artificial counter bearing of the dam (yellow, GPS-Reference station) and the middle of the dam arc (red, Rover 1). The stable reference point (red, Rover 2) is shown in the figure right. The system GOCA is going to be installed next in Quirnbach near Glan-Münchweiler in commition of the German highway administration and as a project of GeoInternational, Mainz. 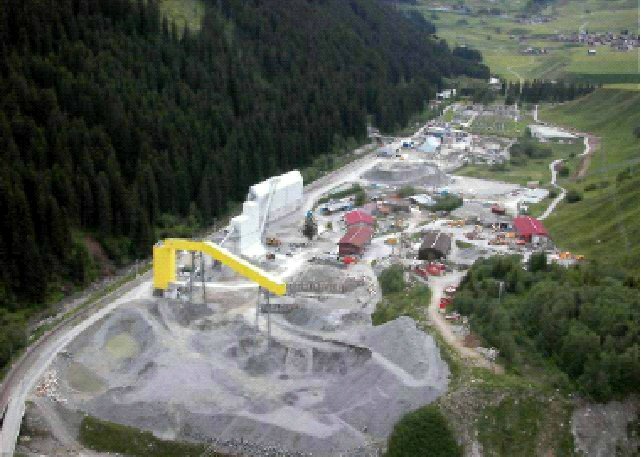 The purpose of the GOCA installation is a long-time "Monitoring and Alert" functionality in the respective landslide area. The slope below the highway A62 moves "only" few cm per year, the resulting damage is however clearly recognizable, e.g. by the displacement of the retaining wall (figure below, left). Due to the continuous undermining and the excavation of coal in this area, a subsidence-hollow arises at the earths surface. 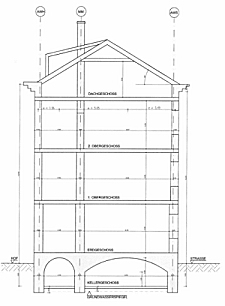 As the deformations endanger the stability of buildings, a permanent monitoring of the subsidence area is necessary. 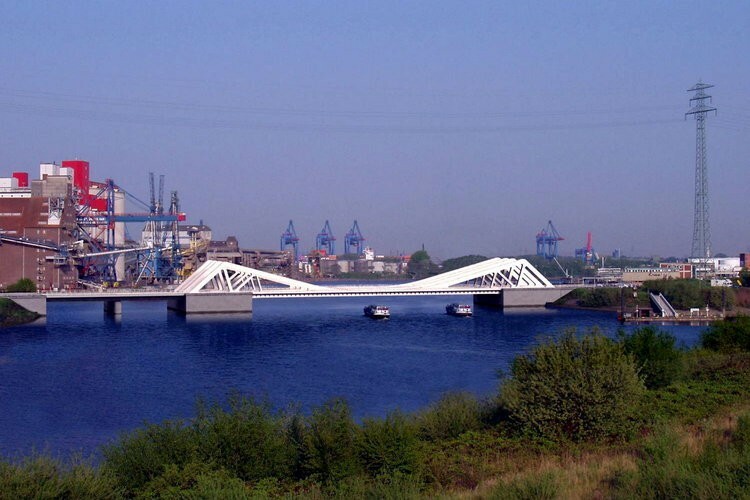 To prove those deformations in Reisbach/Saarland (figure below) a classical deformation network was established in this area in the frame of a diploma thesis running at the Karlsruhe University of Technology. In Spring 1999 the area was observed by GPS measurements for a duration of 3 months in 6 measurment epochs. Deformations in the plan component of up to 25 cm and in the height component of up to 90 cm were detected during this period. 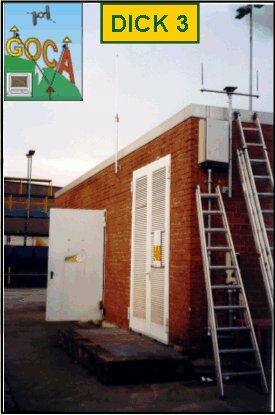 From August 2nd 1999 to February 7th 2000 discrete object, the Lohwies-Hall in Reisbach was monitored with GOCA. In the case of monitoring the Lohwies-Hall (figure right), the receiver hardware consisted of two Leica 300 sensors. 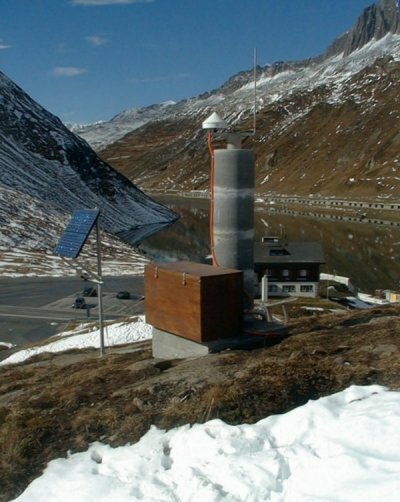 The reference station was installed on the roof of the Lohwies-Hall (object point) and the rover sensor was located on the roof of the northern shaft (reference point) of the mine Ensdorf (figure above). The data transmission between reference station and rover station was done by a radio modem. The NMEA data of the rover sensor was transmitted by data cable to the personal computer in the GOCA-Center. The interface software LeGoTerm received the data and provided them for the further processing to the GOCA deformation analysis software. The figures below show the time-series of the object-point at the Lohwies-Hall determined by GOCA in the period from August 2nd1999 to February 7th 2000. Based on a spline-adjustment a trend-estimation was computed with the GOCA-Software for Northern, Eastern (figure on the top) and Height (figure on the bottom). With the GOCA-Kalman-Filter-module an estimation of position, velocity and accelerration was computed for a selected epoch of five weeks. The figure below shows the resulting object-point-time-series. The graphic-window for the Kalman-Filter results is similar to the standard graphic window and contains the diagrams for position (top), velocity (middle) and acceleration (bottom). As the mining-activities are interrupted at the weekend, the time-series show the resulting delays respective the accelerations in the subsidence-process at the earths surface.